It is currently Thu Apr 25, 2019 10:25 am. I don't see this issue as being much of a problem. The hats were not intended to be cut and now are not able to be cut. We certainly are not going to take players items away from them, or threaten bans as a result of an unanticipated mechanic. There's nothing malicious about the cutting of the hats, it just wasn't intended. I'd appreciate it if this thread didn't turn into a 15 page rant about the inequities of the unexpected. Super lame how I can't make any ice cloth now like everyone else did. Completely unfair, delete the other ice clothes or let me have the same opportunity. How many times has this happened where Derrick says "oops I don't know how that item got in the game ok you can have it BUT NO ONE ELSE!!" How Derrick, Grandmaster freeshard GM, could not anticipate this is beyond me. Yes, and while we are at it lets destroy all grandfathered items that no one else can get too. As for how he couldn't anticipate it, id love to know what your profession in real life is? And you certainly didn't anticipate it being patched. Cut him some slack, if it was possible to anticipate everything then software would never have bugs. Was there any discussion on footstools being now breakable by monsters? I don't remember this issue being brought up (other than for the survival event), and there was no mention there that in era they were destroyed by monsters. And if they are destroyable by monsters, are they also axeable by players? Spent 200k on hats last night, didnt cut them up because I thought they looked nicer being stored in hat form in my house. WOOPS. Part of me wants to rant about how this is unfair, and a massive conspiracy to keep people of my color down, but oh well. The rares market is one of speculation, and I guess I should have considered this an option. But, the silence on the matter, and the fact that it appeared to me to be a perfectly legitimate use of the holiday gifts, let me throw caution the wind. Derrick, I demand reparations. I would like my 4 white hats turned into an eagle statue that says "Mr. Bojangles participated and lost his shirt in, The Great White Hype of 2011" The statue should not be able to be converted into silver. If you refuse my request, I will..... do absolutely nothing. Visit the The Yew Gate Shop for everything you need. Last edited by mrbojangles on Thu Jul 07, 2011 1:17 pm, edited 1 time in total. It's a shame that you're probably being serious. Nice patch -- I've been here a week and am very impressed. Lets make sure this Christmas, we spawn sparkle colored norse helms that can be smelted into ingots, crafted into an indestructible +25 vanq hally with sparkle coloration and is re-imbuable with lightning charges but patch it out right after Guerrilla gets 10 of em, and let Guerrilla keep em. Because we just can't deprive Guerrilla of his items. . . .get real please. Super lame that I can't get CBDs any more without buying them for high cost. 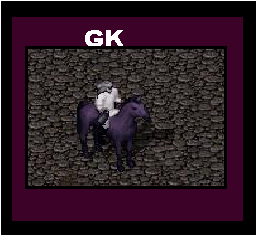 Also lame that I'll never get that purple horse for under 6mil from GK. It is utterly era-accurate that a minor oversite creates items that should not have been, and eventually are no longer accessible but also not being removed from the players who first found it. Things happen and times change things. If you weren't here in the moment, it's your loss. Welcome to UO. What part of the mechanic allowing clothes to be cut into cloth is unanticipated? How are we as players supposed to be able to infer that this fiasco was unintentional? Keep it to fourteen pages or less guys. This kind of thing happened a lot in Era. It even happened in UOR and AOS. They took a strong approach to it later on though. I remember when people had neon purple clothes because they logged out with the faction sigils. GMs started banning people for buying purple halbards. I will you sell you pure white tissues, blessed is optional. The difference between Guerilla and you is that Guerilla didnt wait to cut his hats. Probably safe to say some of the people who bought hats where investing fo the future; buy cheap now, sell high later (like CBDs.) Greed can be a b*tch. You take a gamble, sometimes you win and sometimes you lose. This happens all the time here at UOSA, its a risk you accept playing here. Just make the best of it and become a hat collector like me. KABAL: HEY DERRICK YOU EVER USED SCISSORS ON A HAT!? DERRICK: ROFL NO WHAT HAPPENS!? KABAL: YOU GET LEET ITEMS! We all know this conversation could never happen. I don't understand how he couldn't anticipate this. I'm sure Derrick's UO knowledge towers above mine, but cutting those hats into cloth was the first thing I thought of when I seen it, this is what boggles my mind. If you need to vent just pm me.